This summer Birmingham has had an incredible run of cult movie-musicals on its various stages with varying levels of success. Mamma Mia, Mary Poppins, Grease, Chitty Chitty Bang Bang and now GHOST The Musical has returned to the city for a week-long run at the New Alexandra Theatre. First things first, this production of Ghost has had some terrible online reviews, some might even say its been trolled or abused for click-bait. Having seen, loved (and cried at) the previous run I was really curious to see what'd changed and what could've gone so wrong this time round. Most of the criticism seems to has been aimed at the celebrity leads. Sarah Harding (Girls Aloud) and Andy Moss (Hollyoaks) have been brought in to play Molly and Sam this time around. This, in turn, seems to have lead to a slight lack of budget for the rest of the show, and whilst it did lack some of the life and precision of the previous run, to write it off as a disaster as some have is definitely uncalled-for. For the uninitiated (spoilers alert), the main characters are lovers whose relationship ends tragically when Sam is killed during a robbery. Sam's titular Ghost can't leave Molly's side until he's secured her safety, found some closure with the reasons for his death, and finally confessed his love for her. This storyline does need some kind of emotional depth to fully realise it and to be fair, Sarah's acting is actually more convincing on stage than I expected it to be. Her dramatic skills are arguably better than her singing voice in this setting, as she's clearly more suited to overproduced pop than the exposing nature of musical theatre. Ironically, Andy Moss' singing is better than his acting here, which is all rather upside-down considering the pair's CV. Neither of them are as show-ruiningly, refund-demandingly awful as we may be lead to believe though and I maintain that reviewers have been unnecessarily cruel. The classic "Ditto" moments certainly cause goose bumps and although I didn't cry this time round, it's certainly touching in places. I also hadn't had a wine. 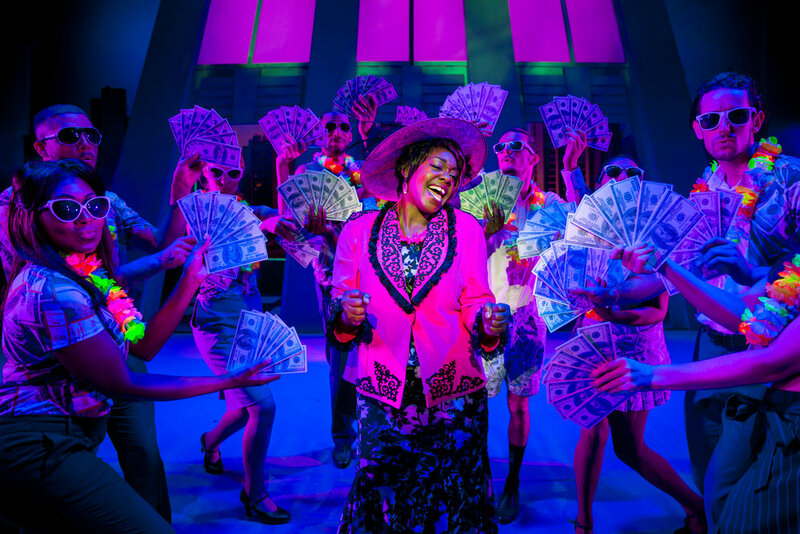 The absolute and constant highlight of the show is definitely Jacqui Dubois' portrayal of "psychic" Oda Mae Brown (Whoopi Goldberg in the movie) who adds incredible gospel vocals and comic timing to proceedings and gives a the dark story a much needed lift. Jacqui certainly received the biggest cheer during the curtain call, and deservedly so as she does bring the whole thing to life. Even the staging is pretty good, although slightly less fancy than the production that came to town a couple of years ago. Some clever slight-of-hand tricks and lighting allows characters to appear and reappear around the set and walk through doors; items can fly and move under the control Sam's ghost and his ilk; and all aspects of New York city life are portrayed. The scary ghost of the Subway does some neat Matrix-style moves too although some of the rest of the dancing in the show could be considered lacklustre. In short, Ghost is definitely not deserving of the slating it's had online. Whilst not an artistic masterpiece by any stretch of the imagination, fans of the 1990 film should enjoy that their beloved original story and characters haven't significantly changed. Key moments like the potters wheel, "Unchained Melody" in various forms and the general plot are all intact. Previous fans of Sarah and Andy will go and see it anyway, and no-one should come away disappointed. If it's lacking anything, it's confidence. A reduced staging, critical battering and weeks on the road can't have helped that. Perhaps it's time this one was finally laid to rest, once the die-hard fans have had one last go on it. GHOST The Musical is on at the New Alexandra Theatre until Sept 24th with Weds and Saturday Matinees. Tickets from here.